Average Height	: 9" - 11"
Photo Courtesy of : National Brussels Griffon Rescue, Inc.
Brussels Griffon have a characteristic all their own ~ they are known for 'talking' to their owners. There are three varieties of Griffon, the Brussels Griffon, Belgian Griffon and Petit Griffon. The feisty little Brussels Griffon traces their roots back to Belgium, where these small, terrier-like dogs were bred to hunt and kill vermin in stables, especially those of horse-drawn hansom cabs. The Brussels Griffon we know today was created from several breeds, including the Pug, the Affenpinscher and the English Toy Spaniel. The Affenpinscher contributed to the size and wiry coat texture, while the Toy Spaniel influence is seen in the large, expressive eyes, rounded head, and upturned underjaw. The Pug influence is seen In the smooth-coated variety of the Brussels Griffon. These crosses resulted in the creation of this small dog we now call the Brussels Griffon that has great rat-hunting abilities and an almost human-looking face. Europeans like to call this breed the Griffon Bruxellois. As this breed was developed they became very popular as house pets with both noblemen and workers. By 1883, Belgian breeders had created a standard for the breed — a written description of how the breed should look--and started entering them in dog shows. Belgium's Queen, Marie Henriette, was quite the dog enthusiast and fell in love with the little Griffon Bruxellois; began breeding them and then promoting them throughout Europe and abroad. By 1889, the Club du Griffon Bruxellois was formed in Brussels ~ & the smooth-coated variety emerged and was named the 'Griffon Brabancon'. 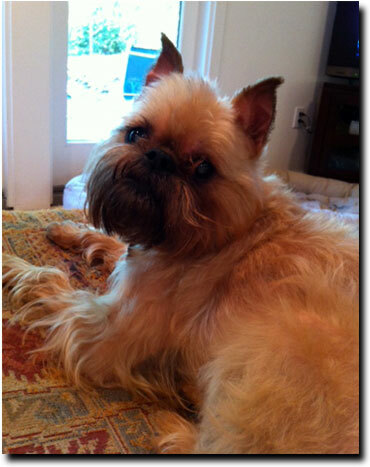 Both rough-coated and smooth-coated Brussels Griffon began being exported to England in the early 1890s. The cocky little dog found its way to the U.S. around the same time, in fact in 1899 the first Brussels Griffons were registered with the American Kennel Club and were shown at the Westminster Kennel Club dog show. The numbers of Griffons shrank during World Wars I and II, when breeding dogs, or even keeping a small dog as a pet, was a luxury that few could afford. By the end of World War II, Brussels Griffons were nearly extinct in Belgium, but their popularity in England remained and this breed's standards, personality and character was preserved by English breeders. While the Brussels Griffon became trendy in the late 1950s and their popularity held ~ they have always been considered a 'rare breed'. The Movied starring Jack Nicholson "As Good As It Gets" saw a resurgence of demand by dog lover everywhere for the Brussels Griffon. •	Good Watch dog ~ will alert you to people at the door. •	Not a great family pet. They are better with a one-on-one relationship. •	Sturdy breed, few health problems. Brussels Griffons are a breed known best for their unique and distinguishing look. Wide set eyes, flat face and prominent chin coupled with their cheerful terrier disposition has won the dog a small but dedicated following. Their expression is commonly said to characterize that of an elf or monkey. The Griffon was developed with both a rough coat and a smooth coat. A rough coat consists of coarse, wiry hair, while the smooth coat is glossy with hair that is flat and close to the body. Both are equally popular. Brussels Griffons are a good choice for older couples or adults who live alone and want or need a companion to share every moment. This is a breed that has a tendency to be sensitive to sound and sudden action and children tend to naturally exhibit these types of behavior, therefore this is not a breed best suited for children. Griffons can become ‘nippy’ if provoked or suddenly frightened. The Griffon has the temperament of your typical Terrier Breeds. Brussel Griffons do not do well being left alone for long periods of time. They demand constant contact and companionship with their owners. Sensitive to a fault ~ they are not an overly shy or aggressive animal and quite often are noted for the smug or superior look they give when at ease with the world. However, they rely on consistency and a low key environment to be at their best. This is a large reason why they do not do well as a family pet, especially when there are extremely small children in the household.. They are good with other pets, however their feisty personality has been noted that on occasion a Griffon, having a rather slim concept of its own size, has been known to try and assert his or her dominance with a dog much larger than itself. Socialization from an early age can help to keep this to a minimum. Griffons are natural watchdogs and are known to be wary of strangers and may feel threatened. He or she may abruptly snap at the stranger out of sheer nature ~ therefore it is best if you socialize your Griffon to newcomers and ask others not to reach out & pet your Brussels before being properly introduced. In general, a Griffon will be great company for you. They prefer a calm environment and for the most part will avoid confrontation to the best of their ability.